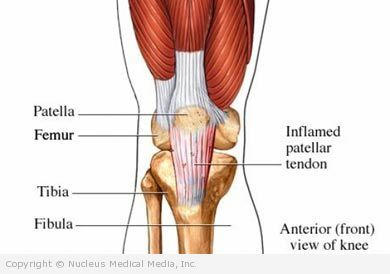 The patellar tendon connects the patella (kneecap) to the lower leg bone (tibia). Tendinopathy and the associated pain may take months to resolve. The doctor will ask about your symptoms, physical activity, and how the injury occurred. The doctor will also examine your knee, and may ask you to perform certain movements. Apply ice or a cold pack to the knee for 15-20 minutes, every four hours, for 2-3 days. Wrap the ice or cold pack in a towel. Do not apply the ice directly to your skin. Avoid the activity that caused the pain. Reduce shock or vibrations to the knee. Topical pain medicines (eg, creams, patches) applied to the skin are another option. This strap (also called a counterforce brace) can help support the tendon and reduce pain. It is worn as a band just below the knee. If the treatments above do not reduce inflammation, some doctors may recommend that you consider a cortisone injection. Check with your doctor to find out what is best for you. Avoid repeated cortisone injections. The knee can bend and straighten without pain. You are able to jump on the injured leg without pain. You are able to jog in a straight line without pain. Normal strength of the quadriceps muscles has returned.